CAIRO, Egypt – In recent months the Egyptian Radio and TV Union (ERTU) has extended its long relationship with Studer digital consoles by placing a sequence of orders that bring a further 39 OnAir 3000 desks and a Vista 8 into the national broadcaster’s estate. All will be located at ERTU headquarters in the Maspero TV building. The new sales represent a total of six separate orders. 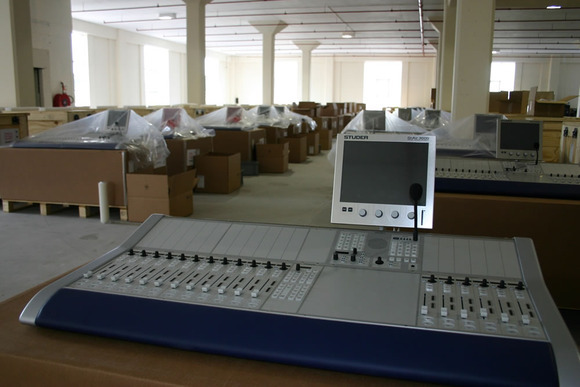 First, the organization equipped three TV studios with three OnAir 3000 digital audio consoles and peripheral equipment such as active audio monitors, headphones, telephone hybrids and distribution amplifiers, as well as full engineering services, commissioning and training. ERTU then equipped a complete music recording studio (Studio 45) with a Vista 8, satisfying the requirement for an audio multi-layering mixing console. This was supplied with a Pro Tools set-up, active audio monitors, headphones and other recording accessories. Some of the Studer OnAir 3000’s are configured for 18 channels, some for 24-channel operation (for both on-air and production operation). ERTU has also upgraded 11 on-air and 19 different production studios with peripheral equipment such as headphones, active audio monitors, microphones and recording equipment. According to Studer’s business consultant for the Middle East and Africa, Mohamed Ali (of ICT), the enhancement of existing facilities is in line with the Union’s policy of continually reviewing and renewing their equipment as part of studio development throughout the country. In addition, ERTU has recently ordered eight OB Vans, which will be equipped with Studer OnAir 2500’s — and these will be used for various TV OB applications. In conclusion, Mohamed Ali states, “These orders further cement the strong business and personal relationship that Studer continues to enjoy with ERTU, and which now stretches back over a number of years. A spokesman for ERTU responded, “The management and staff have become accustomed to using Studer systems over a number of years and continue to be more than satisfied with the products. This has given us confidence in everything bearing the Studer name.